Life in Los Angeles is often lonely. In a fast moving, image driven city like L.A. it's easy to get "lost in the sauce". That's why we're here. HOPE LA welcomes and inspires you to know that in Christ Jesus, we are all connected by that one great Love. Here, you can know that you are never alone! At HOPE LA, love rises and blesses us all. Check out what we believe and the promises God has called us to make to you and to our community. Ready to take the next step? Connect with one of your new friends and neighbors at HOPE! Officially title “The Trinity” by painter Holly Ann Schenk. This has been a guiding image at HOPE LA since the beginning of our church “replant” in April, 2015. 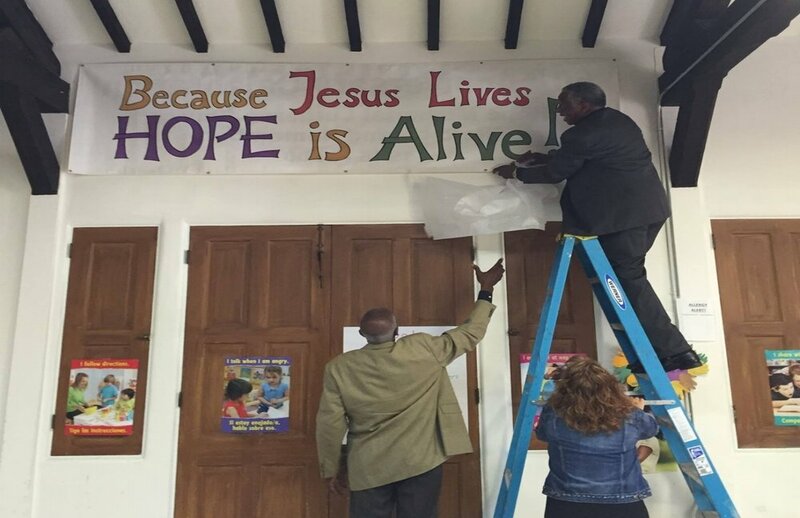 In 2018, we arranged to have it rendered in ceramic tile and placed on the front of the church to remind us of the dynamic, creative, and life-giving energy of Jesus Christ. We think of it as a perfect accompaniment to the LOVE RISES mural, each speaking the language of Hope in a different way.